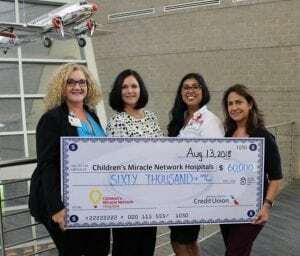 August 27, 2018 | By Fatima V.
FORT WORTH, TX (August 16, 2018) — American Airlines Federal Credit Union proudly presented Children’s Miracle Network Hospitals with a $60,000 donation as a result of the 22nd Annual Credit Union Golf Tournament – which took place on May 11 at Cowboys Golf Club in Grapevine, Texas. The total donation will be split between Cook Children’s Medical Center Foundation and Children’s Medical Center Foundation. The check was presented Aug. 13, 2018, at the American Airlines Credit Union headquarters building in Fort Worth. Karol Johnson, Children’s Miracle Network Hospital Specialist at Cook Children’s Medical Center in Fort Worth and Aracely Munoz, Corporate Partnerships and Children’s Miracle Network Hospital Development Officer with Children’s Health in Dallas, were in attendance to accept the donation from Credit Union President & CEO Angie Owens. The tournament was sponsored by a number of Credit Union vendor/partners, including presenting sponsors: CO-OP Network; Global Vision Systems, Inc.; Symitar; PSCU; and many other businesses who participated at various sponsorship levels. Credit unions hold fast to their motto of “People Helping People” and this philosophy blossoms with the industry’s support of Children’s Miracle Network Hospitals. Credit unions, fund-raising under the Credit Unions for Kids brand, have partnered with Children’s Miracle Network Hospitals since 1996 and have generated more than $100 million in contributions.